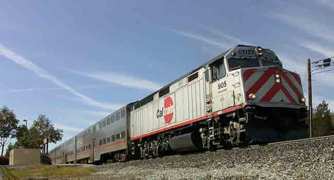 A person was fatally struck by Caltrain in Burlingame late Tuesday, officials said. At 7:02 p.m., Southbound Train No. 284 fatally struck a person who was illegally on the tracks near the Broadway Caltrain Station, San Mateo County Transit District spokesperson Tasha Bartholomew said. Train were temporarily stopped in both directions near the incident. Authorities said nearly 500 passengers were onboard the train. No injuries onboard the train were reported.